Traditionally, spring is the time of hope, energy and new beginnings. Daffodils and crocuses are coming up despite gales, blizzards and the recent earthquake. Traditionally, too, it's the time when New Year resolutions have all but faded. If you're reading this article on how to change your career, that's probably what's happened. The steps outlined here are suggestions. Parts of it may not work for you, and you can be sure that it won't be plain sailing, but there will be elements that you can use. Adapt it to suit you. Career change is not a one-off event, it's a process - and usually a longer process than you imagine. It can be separated into two phases: long-term and short-term, which may overlap, each requiring a completely different approach and mindset. The long-term phase requires you to be open, undirected and even fuzzy. It's in the background. You need to be aware of what's going on around you and be open to opportunities or new ideas. The short-term phase needs you to be clear and focused as you narrow your options down and move to action. you are fixated on the idea of change, and don't pay attention on how to get there. The closer your idea of the future is to who you are, here and now, the more effective it will be. So start with the present. Think about the parts of your current career or job that suit your personality, interests, beliefs and values. For example, do you need security of income, autonomy, variety, or contact with people? Are you in a job that matches your values - working for the good of others, making money and not polluting the planet? Does it interest you? This will give you some general principles to work with. Don't think about what you're going to do yet. Next, look at what's keeping you where you are. What is good about it (something must be, or else you'd be gone)? Steady income? Security? Good prospects? Good colleagues? Add these to your principles. Keep your vision and strategy as open as possible for as long as possible. If you rush this part of the process, you may narrow your options or miss something significant. Stage 1: Create a vision or idea of what you want. Think about what you want from your life in five or ten years' time: day-to-day work, lifestyle, level of income, family, etc. Write it down as a narrative or a list, or draw it if it helps. Hold the idea lightly, let it loose - it won't disappear! Don't rush off on a specific course of action. Let the idea move in your mind and adapt of its own accord. Meanwhile, be curious about the present, pay attention to what's happening now and let that affect your dream. Stage 2: Create some general principles to work from based on your vision (stage 1) and what you notice about yourself in case things don't work out and you have to go back and start again. 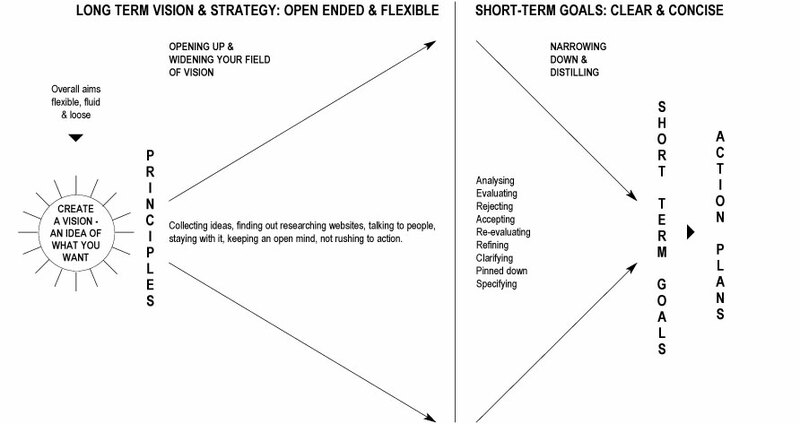 Stage 3: Widen your field of vision and develop a strategy. Start analysing where you are now by researching, collecting ideas, and talking to people. Above all, keep an open mind. Look for opportunities and be flexible, fluid and be curious. 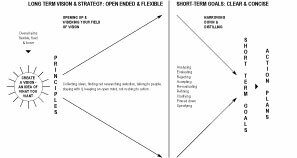 Your strategy is a framework for realising your idea based on your principles, a general direction rather than a set plan. Stay with that for as long as you can before clarifying and evaluating. Bring the vision and strategy into focus, distilling and refining it until it's clear and sharp. Stage 4: Narrow the process down. Look at what you have found out, and start weeding out the ideas that won't work or that you have lost interest in. Match your options with your principles and get rid of any that don't fit. Stage 5 and 6: Set yourself simple, realistic short-term goals (no more than three at a time) and take action. For example: ‘by the end of the month I will have applied for two jobs/made enquiries about training/talked to my manager.' Give yourself a time limit for each one, carry it out and review it, creating a new one to replace it as necessary. The moment you commit yourself, then providence moves too. All manner of things happen to help you that would never otherwise have occurred. A whole stream of events are started by the decision, creating all manner of unforeseen incidents and meetings and material assistance in your favour, which no-one could have dreamed would have come your way. Whatever you can do, or dream you can, begin it. Boldness has genius, power and magic in it. Begin it now.